One of my early thoughts of McFadden at Arkansas was that he struggled with decision-making in non-angle blocking (zone) situations. 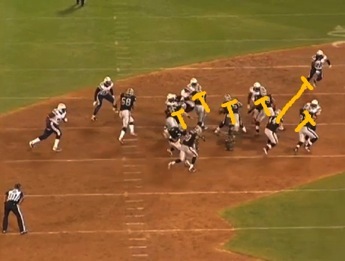 Contributor Nathan Miller shows where McFadden and most of all, his offensive line, is struggling to pick up the zone blocking scheme coach Dennis Allen brought to Oakland. Photo by TipsterHog. Another season, another less than electric year for Darren McFadden. But this time it isn’t due to a lingering injury suffered on the field, in practice, or doing it Gangnam style across his imported mahogany floors. The culprit this time is a change in the Raiders offense to a zone blocking scheme during the offseason. Past history lulled us into thinking the change wouldn’t be a problem, but it is rearing its ugly head once the real games were underway. 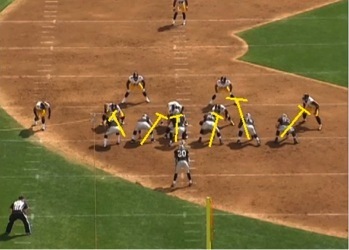 Newly anointed head coach Dennis Allen installed Oakland’s new zone blocking scheme. The switch carries along with it a learning curve that can take time, and significant chunks of practice, to master. This is not only true for the front line that will be carrying out the new tasks, but also for the backs attempting to bounce through the holes the unit creates. Most coaches will agree that zone blocking schemes can require a bit more mental aptitude than traditional man blocking assignments. This is largely due to the change from “block the big guy in front of you,” mentality to an assignment that can call for man blocking, double teams, peeling, and next-threat identification. Decisions must be made before the snap in terms of where any double teams will take place and then after the snap to determine which half of the double team will peel off to seek the next defensive threats. I can see three glaring issues with McFadden’s production after four games. The first, which should improve by mid-season, is that his line is confused. Barring his one touchdown run against the Steelers, he’s averaging less than three yards per carry on anything between the tackles. Time and time again, he is running into a mob of defenders and blockers or he’s getting violated behind the line. Secondly, McFadden is instinctively having difficulty identifying the “correct” hole as it develops. He’s cutting into tight windows when larger holes are opening further down the line. He was well-suited for the angle blocks where he could use his incredible burst and fearlessness to hit the hole hard and dare defenders to hang on tight, much less catch him in the first place. For a zone blocking scheme, he needs to develop more patience. The third and final issue is that McFadden is understandably overcompensating for his lack of production. He’s a Pro Bowl-caliber player that has not fully realized his potential in the NFL. This was mostly due to injury in the past, but now the issue has more to do with the change in scheme. After only one reputable season in four years he is healthy, but failing to maximize his potential. It often appears that he is looking to prove himself on every play. With each unsuccessful run, this tendency becomes more pronounced. He is jumping at non-existent holes at the line and then proceeds to bounce, cut, and dance. The only moderately consistent success he is seeing is on the perimeter outside the tackles. This sounds a lot like Reggie Bush’s tenure in New Orleans after he was hyped as a franchise savior during the NFL Draft. This desire to bounce everything outside might be more than the motivation to hit the home run and get into space. McFadden appears as if he’s motivated to avoid much of the line’s confusion with the zone blocking scheme that is tacking place as they transition to it. His instinct and patience will only develop with improved line play, which many in Oakland hope is sooner rather than later. Color Key: Yellow is correct blocking. Red is detrimental blocking. Blue is the direction of the run. The first play is McFadden up the middle. San Diego’s 3-4 defense has the left defensive end shifted outside between the right tackle and tight end. 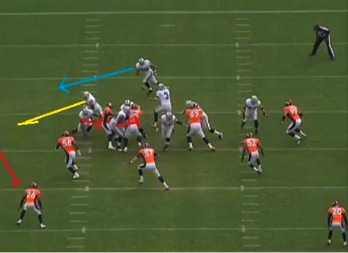 The nose tackle is on the right shoulder of the center, gaining an advantage to that side. The tackle easily has positioning to force the left defensive end to the outside. Unfortunately, the right guard blocks down and double teams the defensive end instead of offering assistance to the center. After the snap the center is quickly overpowered to the play side, and the right guard takes himself out of position when he makes a move on a middle linebacker after the double team. The result is a no-gainer for McFadden. Here is a play to right end. Initial blocks are appropriate, and would appear to open a lane for McFadden. Yellow is appropriate blocking and red is detrimental blocking. But two of Oakland’s linemen peel off of their defender and move down field for the next threat. One of these linemen becomes part of an Oakland-San Diego sandwich (red circles), and the other heads down field to block…absolutely no one. Part of this problem can be explained by timing and length of blocks. The rest is a mystery. McFadden is quickly crushed for no gain. The following play below is a product of McFadden’s lack of comfort with the scheme and his inherent impatience as a runner used to hitting one hole as hard as he can. Yellow is the appropriate blocking, red is detrimental blocking, and blue is McFadden’s options. 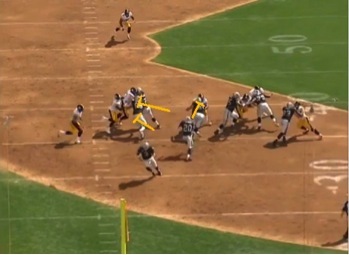 This off-tackle run shows very effective blocking by the entire line. 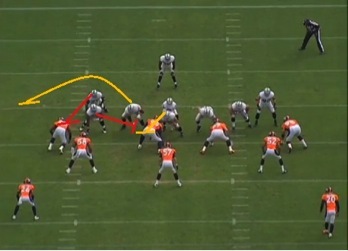 The right guard and right tackle form a great wall on the left, and the tight end picks off the defender to the right. 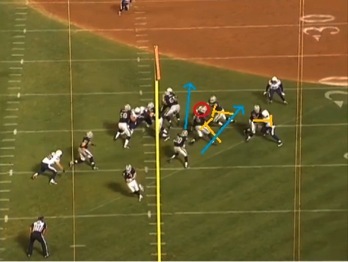 However, McFadden sees the hint of light noted by the arrow on the left and he takes that route. The problem with his choice is that the right guard and right tackle are blocking to that hole, which leaves the defensive end (red circle) completely open to stop McFadden. Had McFadden been patient, and taken the hole designed for him to the right he would have made it to the second level and possibly further. His only home-run play between the tackles this year against Pittsburgh is a later example of what happens when everything works as planned. Here is another play around end which reveals the increased complexity of the zone blocking assignments at the line of scrimmage. Oakland is pulling the right guard, wants the center and right tackle to block down on Denver’s left tackle, and the fullback is supposed to block the defensive end. With the right guard pulling, and having the right tackle block the man on his right shoulder, the combination would likely have been effective enough to at least delay defenders long enough for McFadden to get around them. This would leave the fullback, the pulling right guard, and the wide receiver out of this shot to lead McFadden down the road against the three remaining defenders. What happens instead is a double team by the center and right tackle that is unneeded. The defensive end easily slips through the line due to the length of time taken by the fullback to get in position. The fullback completely misses the tackle. While the pulling right guard is able to stop one linebacker he is unable to do anything about a strong safety and linebacker coming into the play. The receiver on the edge blocks the cornerback with a bump, and then sets him free. This leaves yet another defender to pursue McFadden, who is forced to the boundary for no gain. Here is an off-tackle play to the right. 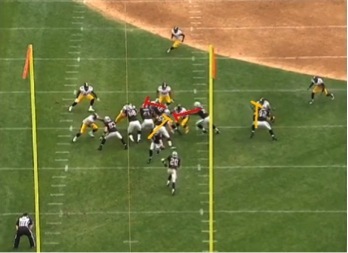 To the left of the hole, you will notice the right tackle chasing after a blitzing linebacker. This presents two opportunities for the right tackle. Bump the linebacker into the pulling left guard and peel to the next linebacker since he has already lost position, or move straight on to the next linebacker since the left guard is on his way. The line instead is chasing after lost blocks and/or continuing with double teams much longer than necessary while completely neglecting on-coming defenders. McFadden gains two yards on the play. Here is another run to end for McFadden, and this is yet another play that initially looks like it could go the distance. As noted in red, two blockers were so completely absorbed by their double-team assignments, that they neglected defenders about to crush the play. The blocker on the left should peel at this point and catch the 309-pound tackle that is slowly making his way play side. The blocker on the right should at some point notice the linebacker closing in. The result: McFadden – out of bounds, loss on the play. 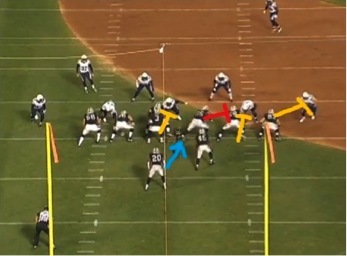 For all the Raiders fans out there, the play of 2012 for McFadden is perfect execution. The line moves right stretching the defenders out and Pittsburgh couldn’t have set them up better. The beauty of this particular play is when the left guard realizes that the center is handling the nose tackle on his own, and peels to attack the middle linebacker on the left. McFadden also works his own magic leaving the free safety in the dust with a quick juke, taking it to the house on a 64-yard run. There will hopefully more of that to come for the Black Hole inhabitants. The bottom line is that McFadden hasn’t changed. He’s still a game-changing back with an elite skill set. Indications from Coach Allen are that the team will evaluate the zone-blocking scheme during its bye week. I would be surprised to see a complete abort of the scheme, but tweaking is likely, and advisable. That being said, the line will eventually gel and work much better together in time. All that’s needed is more reps in the system and time working together. You can reach Nathan Miller via Twitter at @eklektique1 or eklektique1@gmail.com. Very informative. Thanks for the great article. Excellent read, well analysed. 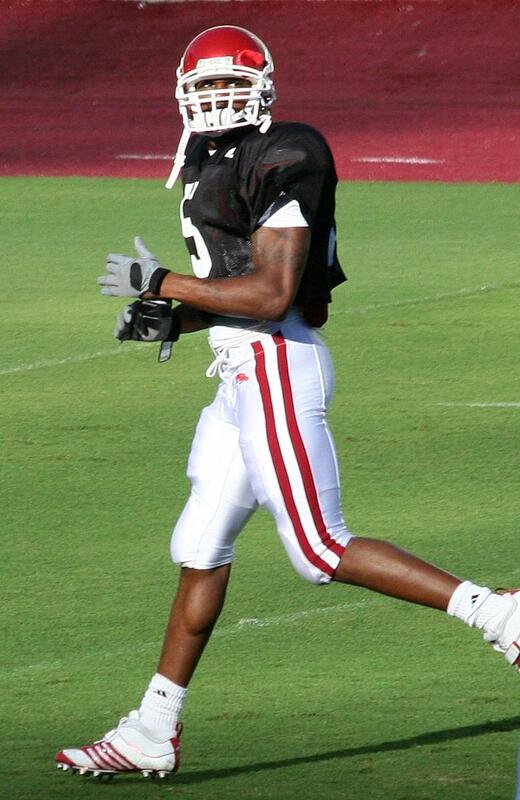 But I think you’re wrong about the potential for improvement–the line can improve, but McFadden will never develop the patience necessary to excel in the scheme, because when he’s forced to hold a medium pace without much acceleration, which the scheme requires him to do in order for the play develop, he loses his ability to accelerate optimally. I agree that he would probably be a bit more patient if he had better numbers, but a good part of it is just his full-speed-ahead nature. If McFadden and a 4.5 RB raced ten yards, full speed ahead the whole way, McFadden wins clearly every time. But if you made them hold a medium pace for 3-4 yards, and only then allowed them to accelerate, they’d be very close together. Very strange sounding, I know, but if you watch the tape carefully, you’ll see that it’s true. One of the most temperamental players I have ever come across, by far. They’re gonna have no choice but to bring back the scheme he succeeded in, I guarantee it.